It&apos;s no secret that people love coming to Dunwoody. We are in close proximity to Atlanta, there are plenty of things to do here, and even more places to eat. But when we tell people to #DiscoverDunwoody, we&apos;re not just talking to humans. Four-legged, tail-wagging visitors love coming here just as much. 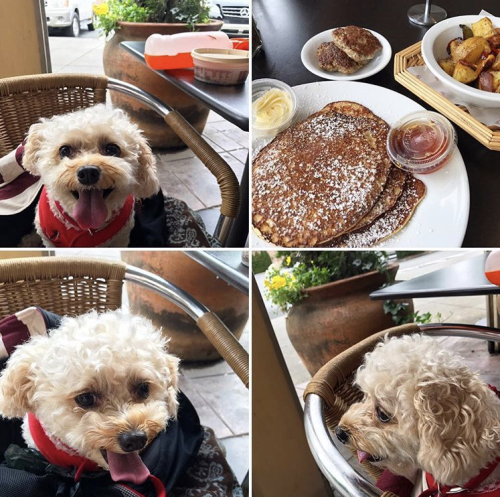 We consulted various #DogsOfDunwoody for their favorite places to frequent in town and made this dog day itinerary. 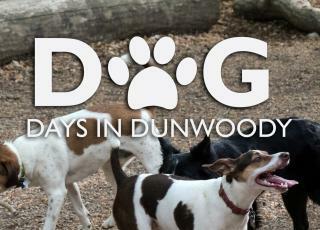 Read their recommendations below and bring Fido, Sir-Barks-A-Lot, Bingo (or whatever his name-o happens to be) to Dunwoody, where every dog has its day! First things first: make sure you are up and ready for the day. We&apos;re talking to you mom and/or dad. The dog(s) already know your routine. You&apos;re no good until you drink that cup of brown stuff every day. The best place for that is Alon&apos;s Bakery & Market. Dogs are only allowed on their patio, so it&apos;s best to bring a plus one if you can. Otherwise, safely secure your good boy or girl before going inside to place your order. Enjoy your morning cup of Joe with a freshly baked pastry while your dog gets in a few morning stretches. Now it&apos;s time to unleash the fun! In the two-acre wooded and fully fenced in playpen that is the Brook Run Dog Park, dogs can run free, be themselves, and make the best of friends. This is where dogs come to see and be seen. This is where they laugh and play. Complete with two water stations (for dogs only - sorry, humans!) and several waste stations, you can be worry-free while your beloved best friend roams carefree. Blue waste bags are conveniently tied all along the fence and on smaller trees within the interior of the park. There is also a separate, optional park for smaller dogs - optional because we all know small dogs think they can run with the big dogs. At the Brook Run Dog Park, they definitely can! 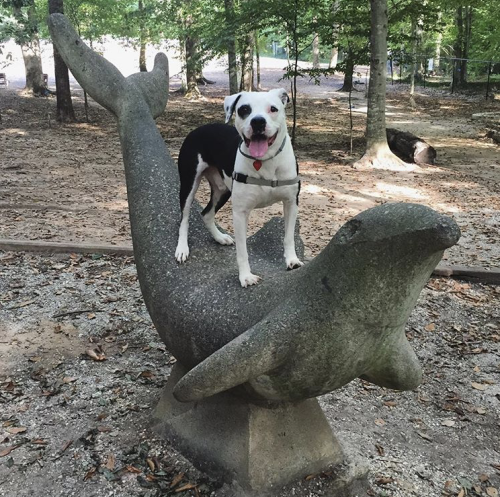 Selfie Spot: Located inside the park is a dolphin statue that serves as a wildly popular selfie spot for dogs. Atop this statue, dogs big and small feel like the king or queen of the world. Let yours get their vogue on, take all of the photos, and then tag us in them using #DunwoodyDogDays. After all of that fun in the sun, your good little doggo could use some cooling off. You could probably use some too (the dogs weren&apos;t the only ones panting at the park.) 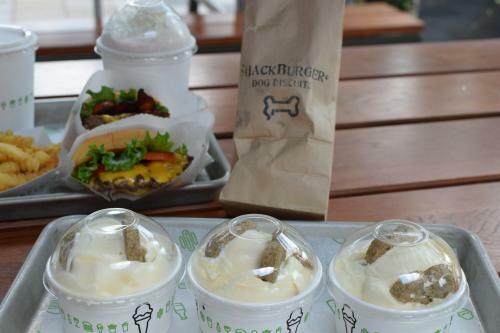 Head over to Shake Shack and order something for both you and your puppy pal as they wait on the patio outside. For you, we recommend the original ShackBurger® with a Peach Twist Concrete. For the dog, there are two options. 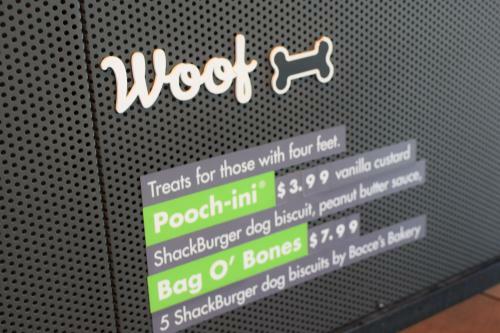 The Pooch-ini consists of ShackBurger® dog biscuits, peanut butter sauce, and vanilla custard. Be aware that the pooch-ini includes dairy, sugar, and nut products, and is not intended for small dogs - although they can have a lick or two! The little ones can shamelessly enjoy a Bag O&apos; Bones. This menu item consists of five tasty dog biscuits baked to canine perfection with love. Now comes the part where you need to walk off all of that greasy and sugary goodness. The perfect place? The hiking trails at the Dunwoody Nature Center. Take a relaxing stroll along the boardwalk, splash and play in Wildcat Creek, and then kick up your paws in the hammock garden. Whether you have two legs, or four furry ones, you&apos;ll feel perfect peace in this woodland sanctuary. It&apos;s been such a long, yet gratifying day. Why not enjoy a couple of cold ones with your FBF (furry best friend) at Moondog Growlers? 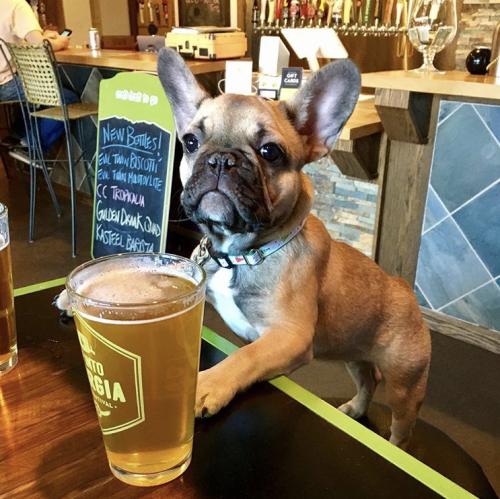 This craft beer bar loves dogs just as much as they love beer, and they REALLY love beer. BYOFood, pull up a seat, and bring your dog inside. While you&apos;re loving the vibe, everyone will be loving on your dog. It&apos;s a win-win. Dogs are our best friends. They are sources of unconditional love and fierce loyalty. 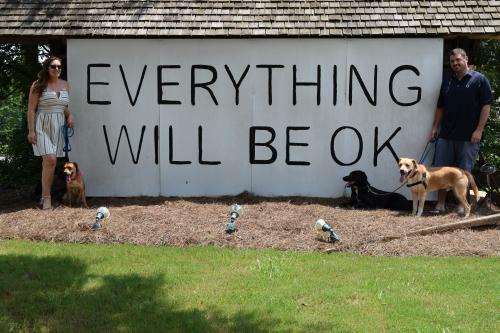 Whether they curl up at your feet, jump on you as soon as you walk through the door, or smother you with wet kisses, they remind you that everything will be ok. Just like our iconic mural here in Dunwoody. End your trip to Dunwoody on a sweet note by documenting it with a photoshoot. You can look back on the adorable photos until the next time you decide to do it all over again. All we ask is that you share them with us! 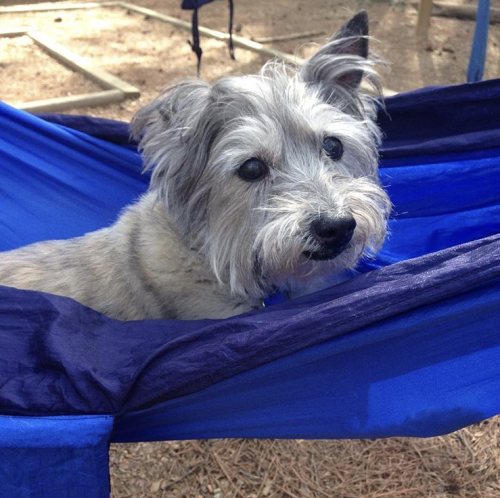 The Pet Resorts - Dunwoody: Here you can find daycare, boarding, and grooming all-in-one! 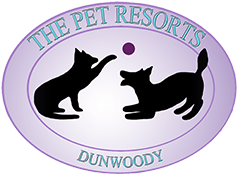 Whether you&apos;re in town for business, leisure, or both, The Pet Resorts - Dunwoody are here to keep, stimulate, and care for your dog the way they deserve to be treated. 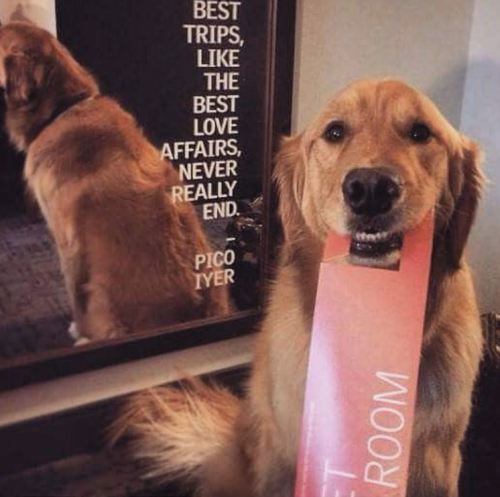 They call themselves a resort for a reason, and your canine companion will bark in agreement. It&apos;s fun for your pet, and peace of mind for you. Check out all of their loving services for yourself at www.thepetresorts.com!